AZWification Don't defend war criminals, guys. It's not cool. Joined on June 13th 2013, last online on 01 November 2018. Don't defend war criminals, guys. It's not cool. Hope nobody defends Bush Senior and Junior when they both die and go to hell. 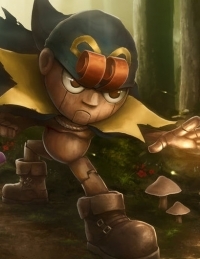 Geno for Smash Ultimate, come on Sakurai! I had to decline your PAL and JP box arts for Battlefield 4 on the PS4 due to the black/white borders on them, They need cropping all the way up to the box art itself so there are no extra borders around it. Alright, thanks for letting me know! Favourite Games: Mario Galaxy, Mario World, Skyward Sword, Ocarina of Time, Resident Evil 4, Halo 1, Metroid Prime, Half-Life 2, Uncharted 2, Portal 2, Red Dead Redemption, Super Metroid, Earthbound, Conker's Bad Fur Day, Xenoblade and MANY more. Favourite Music: Nirvana, Linkin Park, Eminem, Dr. Dre, Michael Jackson, Metallica, 2Pac and of course, video game music. Favourite Films: Jaws, ET, Star Wars V, Spider-Man 2, Terminator 2, Back to the Future, Rocky. Favourite Food: Pizza, Green Salad, Chocolate Cookies, Apples, Oranges, Peaches, Cheese, Roasted Chicken, Waffles and many more. Hobbies: Running, playing video games, talking about games in general, listening to music, watching movies playing basketball and painting when I am too tired to play basketball. About Me: I wanna eat your cookies. Not the browser cookies. Also fellow IGN slave since 2006.